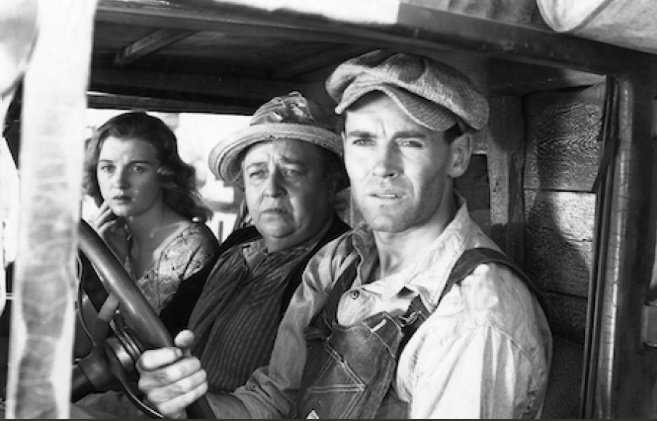 One of the major social justice novels of the Depression era, The Grapes of Wrath, just turned 75. National Public Radio commemorated this milestone. John Steinbeck’s 1939 Dust Bowl epic about the Joad family was based on articles he wrote for the San Francisco News and the Nation on the plight of agricultural workers migrating from drought-ridden Oklahoma to California. It’s a crude monument to the New Deal, a saga heavy with Okie-approximating dialect that is interrupted by “interchapters,” or mini-editorials, on sharecropping, mechanization, and the rapacity of “the great owners” in whose hands massive wealth is concentrated. The landowners’ neglect of the migrants will bring “an upheaval” that takes their land away, unless the government steps in with ameliorating programs. John Ford’s 1940 Hollywood adaptation, which naturally had to pare away all the sociopolitical apparatus, is widely acknowledged to be superior to the original. Steinbeck did, though, take the Depression-era affect with him through life, always presenting himself as a writer in close contact with the downtrodden. It was a pose he labored to maintain in Travels with Charley: In Search of America. “Once a bum always a bum,” wrote Steinbeck in that much beloved 1962 travelogue, in which the celebrity author, then 58, supposedly plumbed the depths of the American soul. He wrote the book after driving from New York to California and back in a camper with a poodle named Charley. The account was largely fictional, the reporter Bill Steigerwald revealed a couple of years ago. Encounters with fascinating people along the way were invented by Steinbeck, and his publisher expunged passages that would have made clear that this was no solitary immersion in America’s gritty reality but a scenic vacation with his third wife.